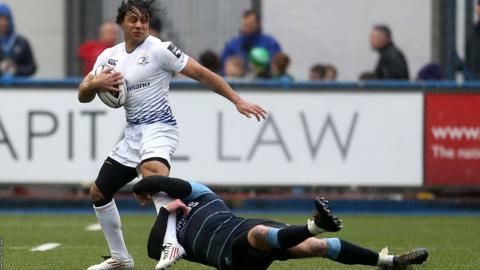 Cardiff Blues coach Danny Wilson was unhappy with his team's second-half display in the 14-13 defeat against Leinster at the Arms Park. After playing into a gale, Blues trailed only 6-3 at the interval. But they failed to take advantage of the elements after the break and left Wilson frustrated. "After all the hard work we did in the first half in the second half we let it get away from us," Wilson told BBC Radio Wales. "Our execution of the game plan in the first half was excellent, the boys played into the wind really well. "In the second half our execution of the game plan was poor." Blues almost salvaged a win when Josh Navidi's late converted try brought them back to within a point with three minutes remaining. But fly-half Rhys Patchell's last-minute drop-goal attempt was charged down. The result leaves the Blues ninth in the Pro12, and struggling to be in contention for European Champions League qualification. It came a week after a shock 13-7 defeat away to Benetton Treviso - two results Wilson fears will have a profound effect on their ambitions. "Last week was a huge missed opportunity and I feel the same this week," he said. "For us to have a real good crack and trying to get in to that top six we needed to win either last week or this week and we've failed to do so."